Senior Murphy will compete in the 3,000-meter steeplechase Friday night (May 26). Classmate Damon Pruett will run the 10,000-mter race on Thursday night (May 25). Pruett’s 10K is slated for 9:40 p.m. on Thursday while Murphy’s event is scheduled for 9 p.m. on Friday. Murphy, who began his collegiate career at Vincennes University after an outstanding prep career at WCHS, was the program’s first-ever NCAA Regional qualifier last season and Pruett became the second in school history this season. “It’s an honor for these guys to have qualified for regionals,” IUPUI Head Coach Chuck Koeppen said in a story published on the IUPUI Athletics Website. “I know they’re going to go down there and compete and try to make it to nationals. They’re two of the hardest workers I’ve ever been around and they’re deserving of this opportunity. Pruett’s school record 10K time of 29:52.03 has him ranked 45th of 48 runners as he’s making his first career regional on the track. He finished fourth at The Summit League Championships with a time of 30:36.29, trailing only a trio of South Dakota State runners. The top 12 runners from the 10K race will move on to nationals. Murphy just missed qualifying for nationals last season and enters this year’s steeplechase with a season-best time of 8:53.64. He’ll run the third and final heat of the evening and enters the week ranked 45th nationally in the event. Last season, he ran a school record time of 8:47.87 in Jacksonville, Fla. The top three from each of the three heats will move on to Eugene, along with the next three top times. Murphy was the Jaguars’ first-ever All-Region performer in cross country last fall. He was Co-MVP with Pruett of the cross country team following his junior season. Murphy helped Warsaw to a fourth-place finish in the Cross Country State Finals as a senior in 2012 and helped the Tigers’ track team place fifth in the State Finals in the Spring of 2013. He was Team MVP for both squads as a senior, starring for coach Jim Mills in cross country and coach Matt Thacker at WCHS. He then went on to earn All-American honors at Vincennes before coming to IUPUI. 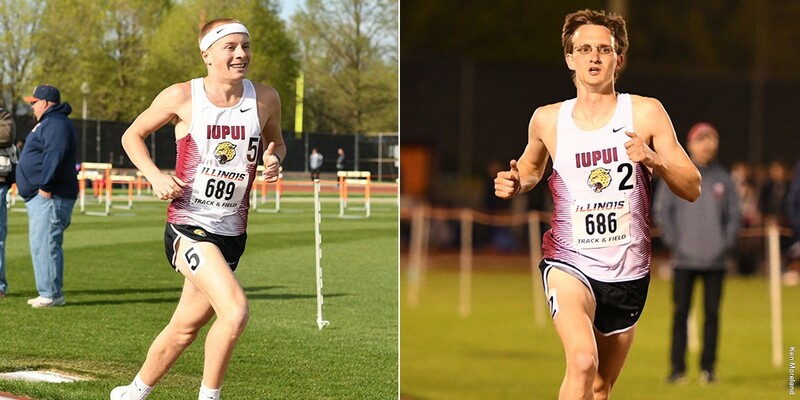 Murphy, the son of Jeff and Lynn Murphy of Warsaw, has become a standout athlete and the top distance runner in the history of the IUPUI program after having been diagnosed with autism at age three. Live video of the meet will be available via SEC+ and ESPN3 and live results will be available throughout. In addition, full recaps will be posted to IUPUIJags.com following each evening’s action.